All rooms have en-suites and heating systems. Warm, clean, well equipped, Free Wifi ( 200mb limited). The Lazy Shag is set among magnificent trees with superb mountain views and gardens that stretch down to the river. Lovely place in a great location, thanks! Stayed with older children and found that it was safe and functional. Our older boys had a room to themselves and we had no issues. Basic, but comfortable beds with ensuites in each room. We would definitely stay here again. 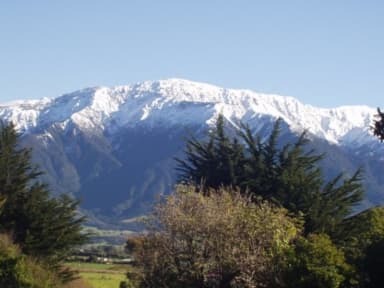 Easy walking distance to Kaikoura township and surrounded by takeaways, restaurants and a supermarket close by, made food easy. We are a retired couple (60+) and the Lazy Shag was our first ever hostel stay. We were very pleased with the accommodation (private room with en suit) It was basic but very clean and functional. The kitchen facilities where were also very clean and functional. The tv lounge was cold (April) but didn’t stop us from using it. All in all a great place, met some great people of all ages . Would use again. 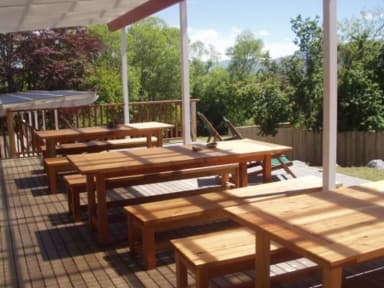 Good simple hostel for Kaikoura. Kitchen was good, apart from silly 9:30am kitchen closing rule. Rooms were okay, beds were pretty basic but mattresses were very comfy. Overall good value for money.